Hockey season is fast approaching, and to commemorate one of our favorite sports, we have added a new line of custom stickers to our website. We call these our Hockey Puck Stickers. The hockey puck labels are made with our regular white vinyl material. This means they will have great color reproduction and a great adhesive. They are waterproof and UV resistant so you can continue to use the puck in games. The templates are pre-set to fit perfectly on a regulation size hockey puck, so all you need to do is choose from our various artwork or design your own labels. 1) Party favors. Hosting a birthday party for your hockey playing kid? These make great party favors that guests can use again and again. 2) Groomsmen gifts. Are all of your groomsmen hockey players too? Customize the pucks with each groomsman's name and the date of your bachelor party. 3) Team Pucks. Part of a community hockey team, or a player for the school team? 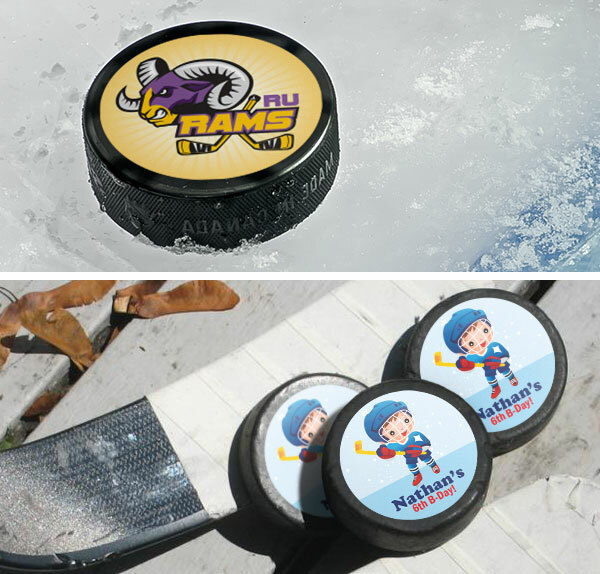 You can design your team pucks with your name and mascot on them. Perfect for home games. 4) Prizes or awards. Running an awards ceremony and need a cool (yet affordable) item you can give away? 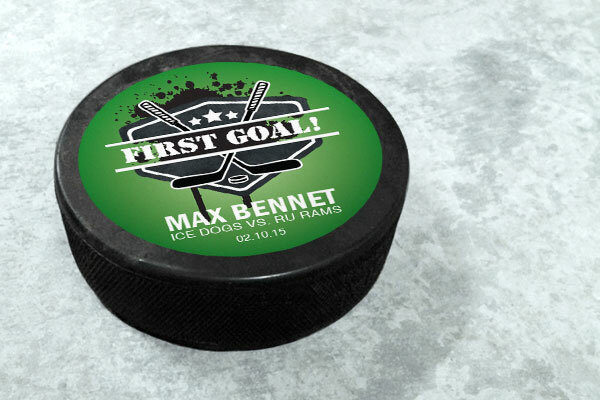 Design your own puck labels specific to the awards ceremony or event and then buy a pack of blank pucks. It's fast and easy. 5) Special gift. Make a set of labels that each say something different, such as "First Game", "First Goal", "First Championship", and any other firsts you may want to include. Stick these stickers on the pucks from each game when that first occurred. Get the set of pucks mounted and framed and give them to your child years later. Super sentimental.